made television advertising on its network of TV affiliates easy and manageable. To get started all you need is a television advertisement, a Google account, some money and a few minutes. Users without a Google account can easily get one by visiting Google. Once your account is created, you can associate your account with Google AdWords and Google Analytics. These two Google services provide the backbone to the Google TV Analytics program. AdWords is the interface that allows you to define your advertising campaign and Google Analytics is the tool that measures the results from your advertising. When these services are configured, you are on your way to effective television advertising. Google has an Ad Creation Marketplace that can help you create a professional television advertisement. You can also choose to use your own marketing firm to produce your ads, or create them yourself. Make sure that your ads are broadcast quality and meet the standards for Google's TV advertising program. One thing to keep in mind while creating your ad is that Google's analytics depend on an ad sending people to your Web site to determine the ad's effectiveness. If you aren't promoting your Web site, you can still use Google AdWords to manage your campaign, but you won't benefit very much from analytics. Once your ad is created, you log into Google Ad Words, and create a campaign. After uploading your television advertisement, you can select the TV networks and shows during which your ad will appear using Google AdWords. With Google, you have the ability to target your audience with precision with the analytics program. With real time feedback online, you can view your Web site traffic in relation to your advertising spots, so you can see how effectively your ad is drawing people to your Web site. In short, Google TV advertising allows you to tie together advertising efforts from television with traditional online marketing. 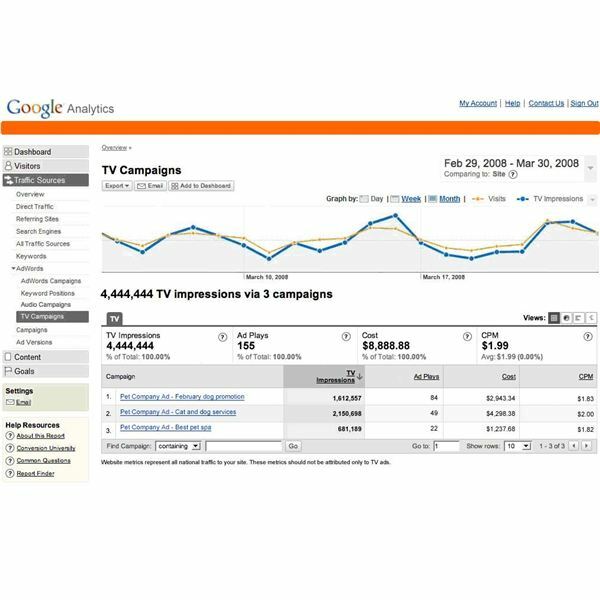 One thing to keep in mind while creating your ad is that Google TV Analytics depend on your ad sending people to your Web site to determine the ad's effectiveness. Google Analytics can help you determine the effectiveness of each of your advertising spots. As your campaign progresses, you are able to focus on the advertisements, shows, and demographics that produce the best results. Keep in mind, however, that the analytics program assumes that advertising is designed to promote your Web site. If the goal of your television ad does not involve your Web site, you may find that the analytics program is not useful for you, although you can still use Google TV advertising services. Google TV ads also are limited in that they can't distinguish the impact of your television campaign from other campaigns that you may be running either online or offline. For example, a surge in visitors to your Web site could be a result of a recent direct mailing rather than television advertising. In spite of its limitations, however, the analytics platform gives businesses the ability to advertise on television at low cost and to tweak advertisements based on the correlation of a broadcast advertisement with Web site traffic. Google's analytics for Google TV is the latest in Google's innovative approach to the integration of all advertising media within one management interface.